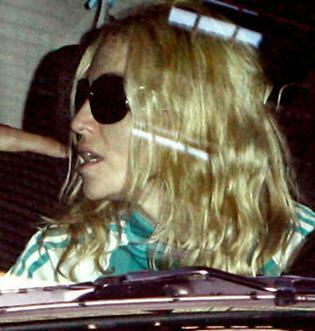 Madonna, at the center of a media frenzy since it was announced that she and Guy Ritchie are to divorce, skipped town this afternoon to head to her next concert date — leaving her exclusive New York City apartment building in a swirl of gossip. According to the Times of London, The Material Girl has hired Prince Charles’ divorce lawyer Fiona Shackleton to represent her. Shackleton also repped Sir Paul McCartney in his divorce from Heather Mills. Last night, even before news of the split had officially broken, there was already a crowd of photographers waiting at her house for her when she arrived home late, looking exhausted but wearing a brave smile. And today, even though the Hung Up star has a concert date at the TD Bank North Garden in Boston tonight, she stayed holed-up in her huge Upper West Side apartment until the very last minute, only making a dash for the airport at 2.30pm in time for an 8pm show. Madonna, who has been married to Guy for eight years, is set to play two dates of her Sticky and Sweet tour in Boston, before heading to Canada for the next leg in Toronto.